Rhonda, one of the owners of Heritage Hemp Products, went on our website earlier this week and went through our order system to use our website builder platform. However, before making the payment, she called and asked some questions about it. She already had a hosting account with another provider and during the discussions, she opted to just have us build the website for her on the existing hosting provider instead of using the website builder to do it themselves. When we were getting ready to start on the site, we noticed the website builder of her other hosting provider was very limiting and would not provide the results that they wanted. We spoke with her further and she opted to have us host the site and build it on our platform instead. Since Rhonda had already sent all of the information and pictures they wanted on the site, we were able to get the site completed in 24 hours. The website was just approved and is now available! We are hoping to ‘win’ her business for their other cattle and ranch website since they are paying twice the cost compared to our yearly hosting plan. This would essentially provide hosting for both of their websites with us for the same cost they are paying yearly for one website with the other provider. 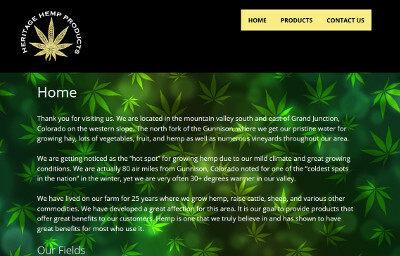 The Heritage Hemp Products website is at heritagehempproducts.com.